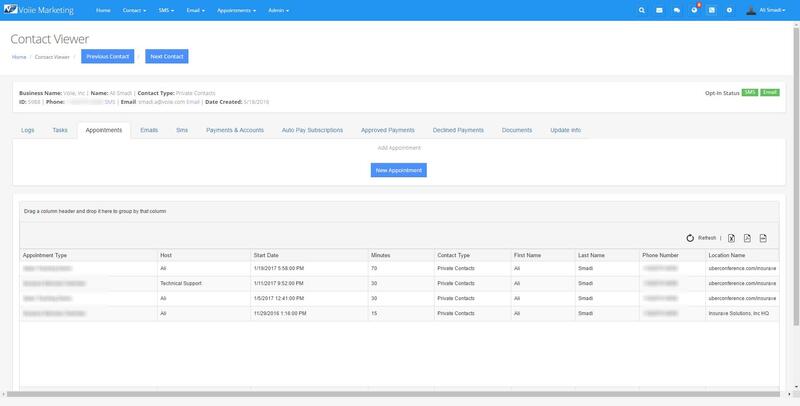 Quickly organize, manage and track all aspects of your contacts or customer, their policy and service sales. 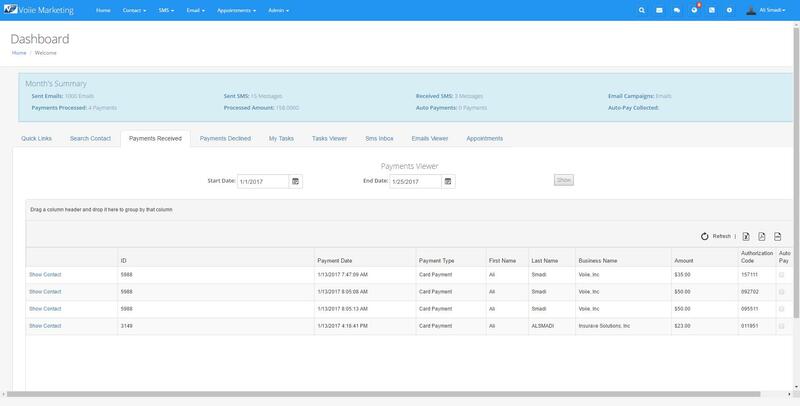 Payments processing using ACH and Credit/Debit Cards, Appointment Reminders Using Sms and Emails. 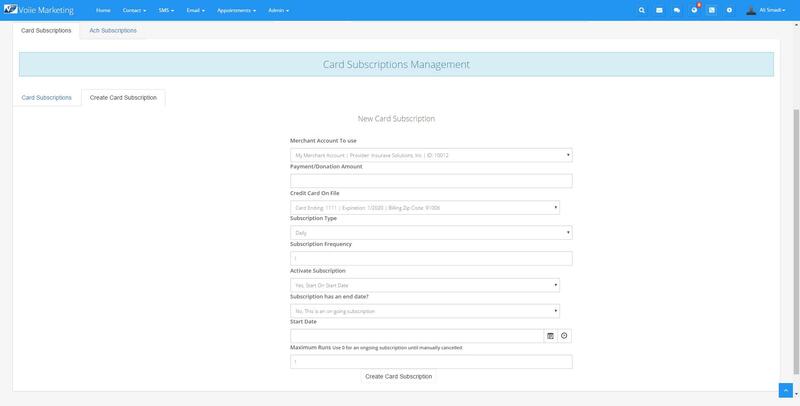 Process and Schedule ACH and Credit Card Payments. 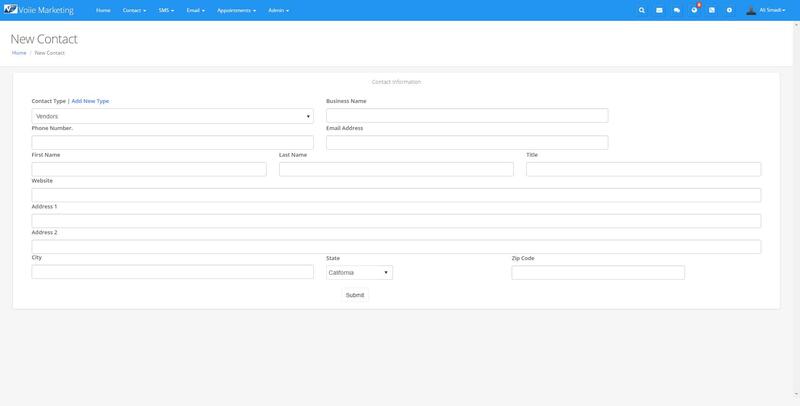 Send and Schedule SMS and EMails to a single contact or group of people using Template and more. 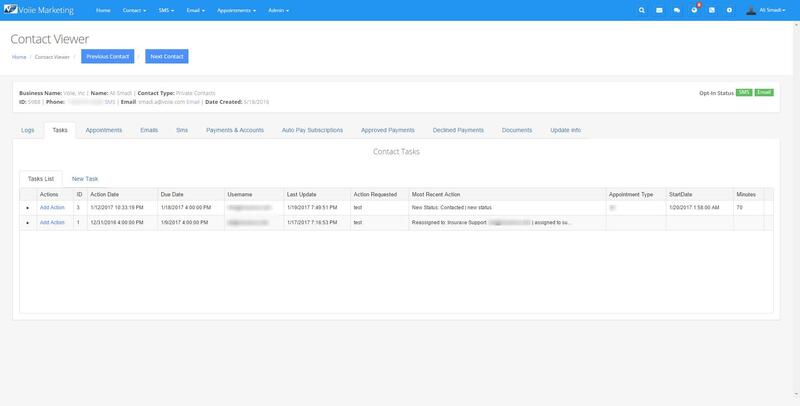 Track your sold policies and get reminders before their expiration date. 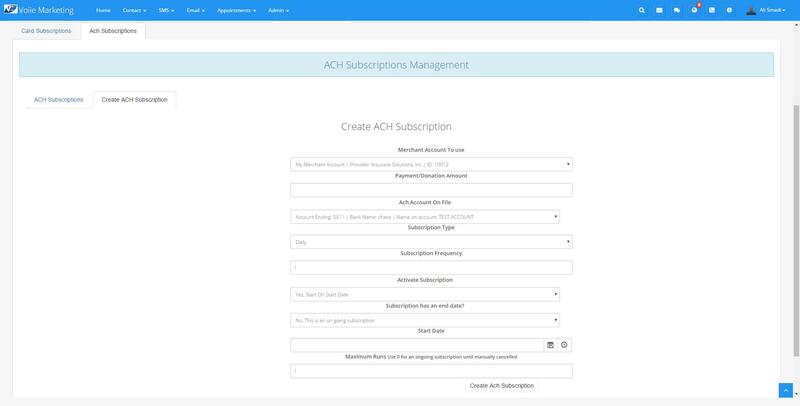 Schedule appointments and automate appointment reminders. Collect donations or monthly payments, including Payment Widget for your website. Keep track of all events and logs happened with each one of your contacts. 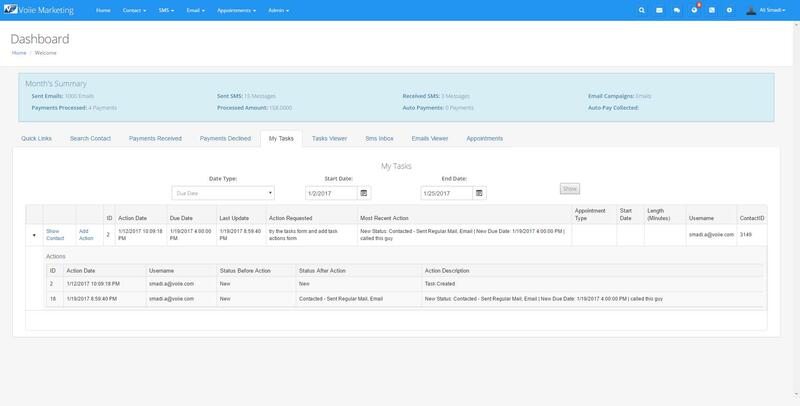 Automated Appointment Reminders are sent to remind your contacts with their coming up appointments by SMS and EMail. Send and Receive SMS Messages from any US phone number, including Toll Free SMS Messaging. 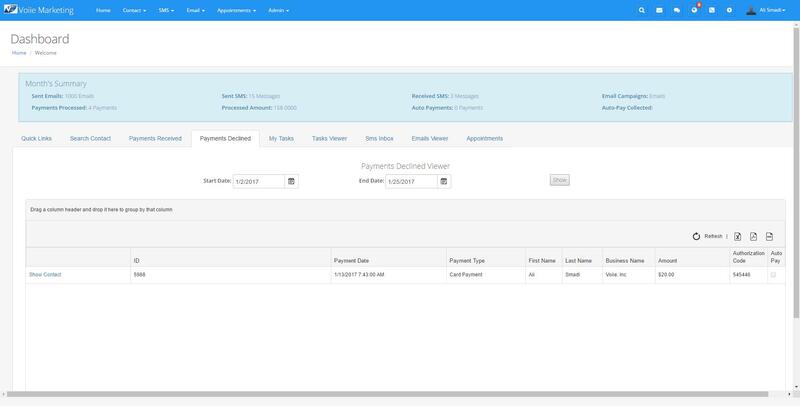 Instead of processing checks manually, or making a trip to your bank every day, you can process all received check and checks over the phone directly from your screen. 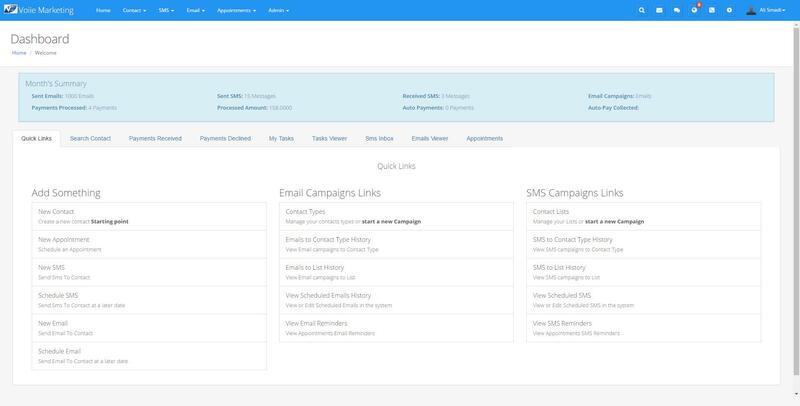 With built in SMS and EMail to lists and types, you can market and promote your business or cause to your audiance. 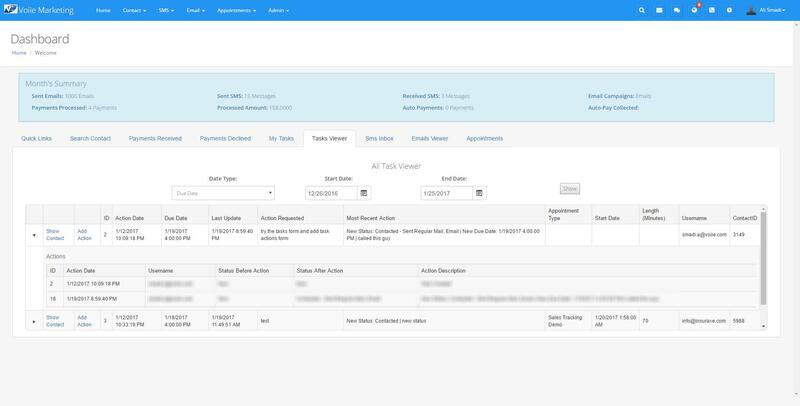 Manage your daily tasks and perform better with all in one spot hub for contacts management. Easily find your contacts by name, address, email address, phone number and Contact ID. 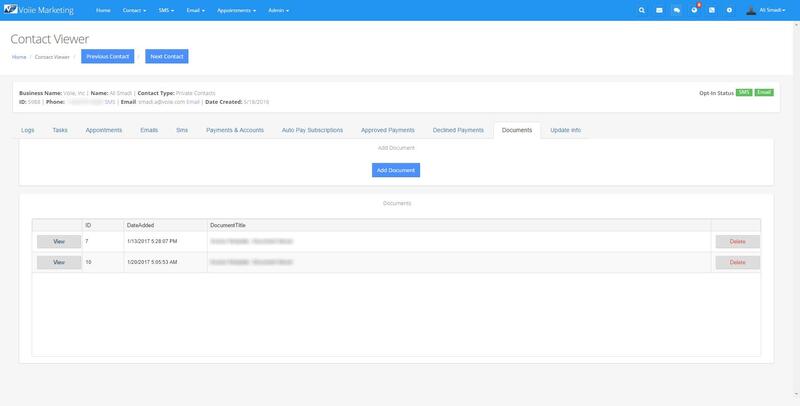 From the convience of your dashboard, you can view payments received and approved from all sources, like Manual Payment, Web Pay and Automated Payments. 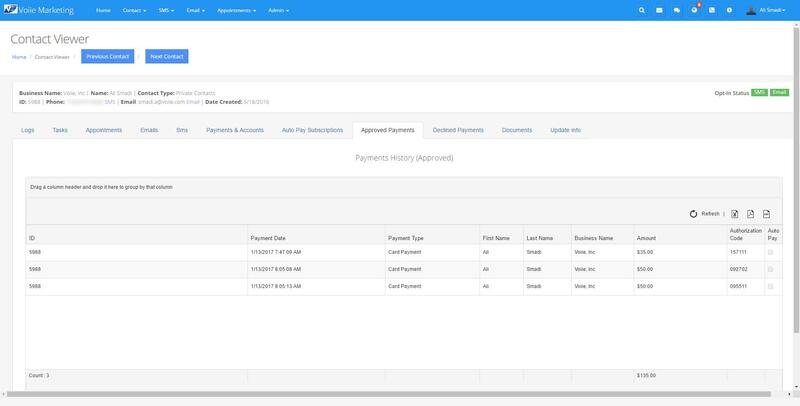 View and Contact the declined scheduled payments from your dashboard too. Get Organized, You can see your daily tasks so you never miss anything, sometimes it is hard to remember everything. If you are a supervisor or in position to ensure tasks are done, you can see everyone's tasks and their status or actions performed. 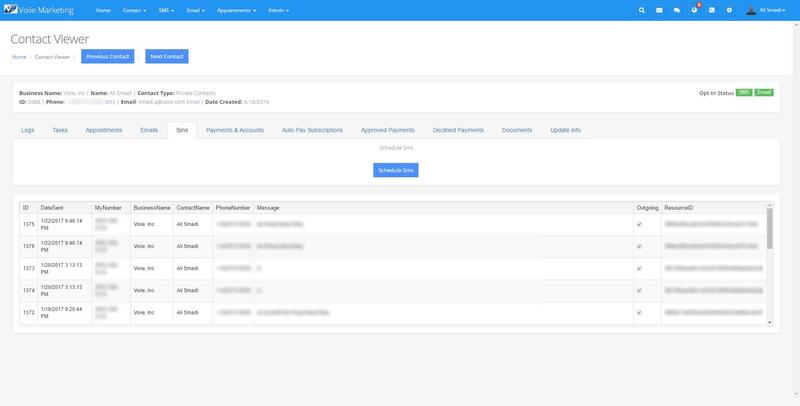 Yes, Voiie CMS has 2 way SMS and you can view all incoming SMS in your SMS inbox, no need to use personal cell phone to contact customers or doners. 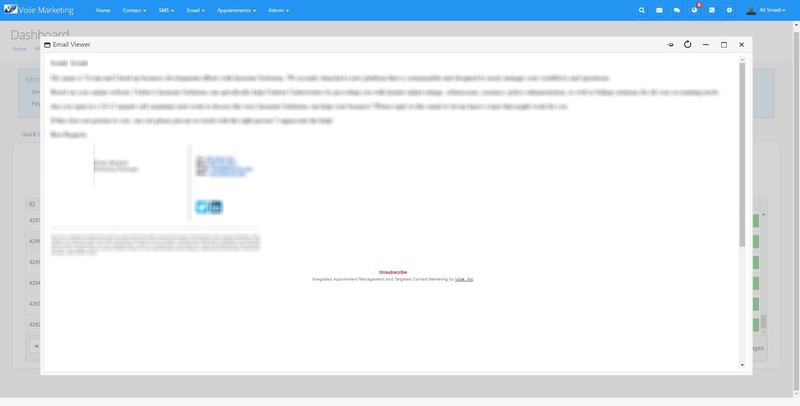 Track all sent Emails from Voiie CMS and instantly without leaving the page, you can view the email. Keep a copy of all sent emails for your reference. View your calender, stay on top of your appointments. Simple add form to your contats. 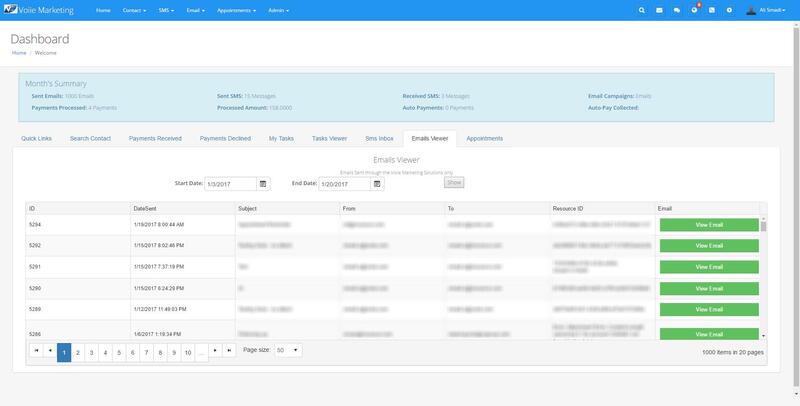 Log everything and every interaction you have with any of your contacts, doners or custoemrs. 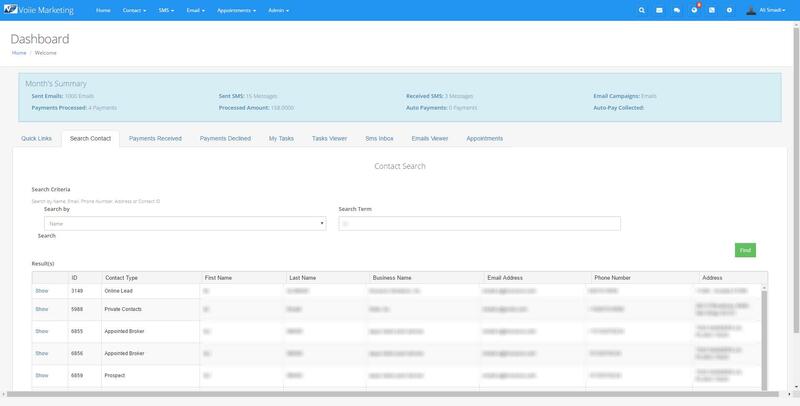 View and Add Tasks for your contacts within the Contact Profit. 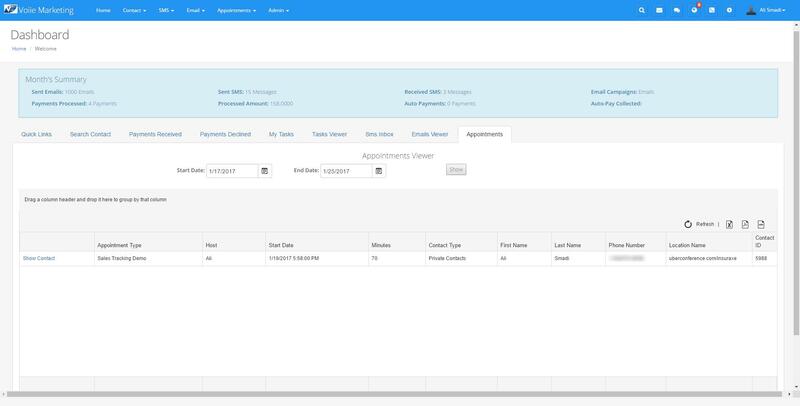 Schedule a new appointment from the Contact Profile Viewer. View all sent emails to your contact from the Contact Viewer. View Sent and Received SMS Messages to your contact, Schedule or send New Messages. 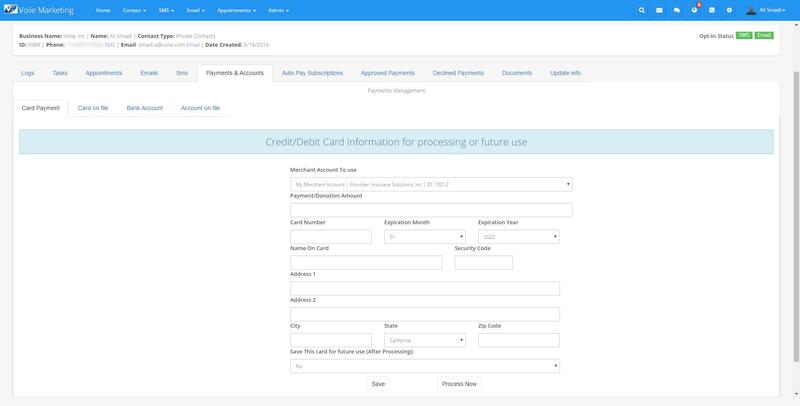 Process Credit and Debit Cards payments within the contact profile. 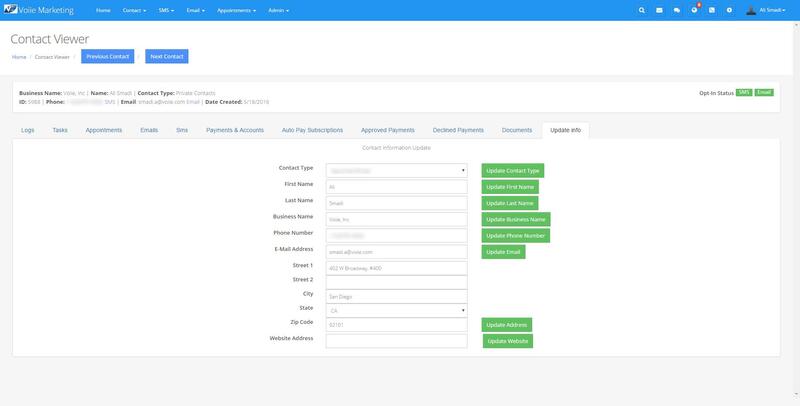 If one of your customers/doners would like to make daily, monthly, weekly or annual payments or donations, You can Schedule it, very flexible scheduler. 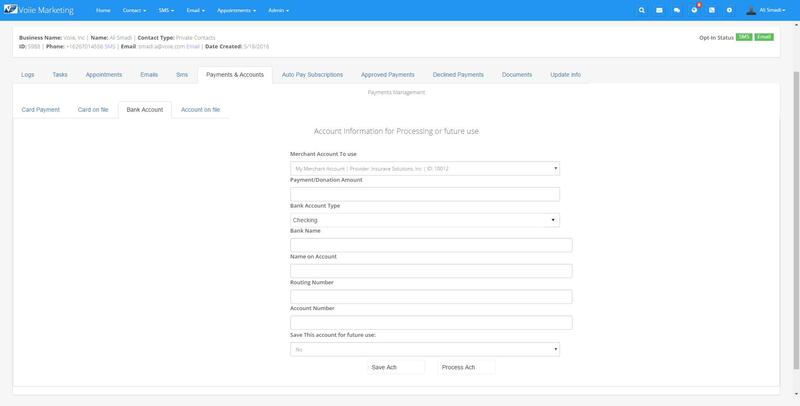 You can safely store your contacts payment methods and use it to process at later date. ACH is a low cost payment processing, we provide it!, saving you tons on Credit Cards Fees. 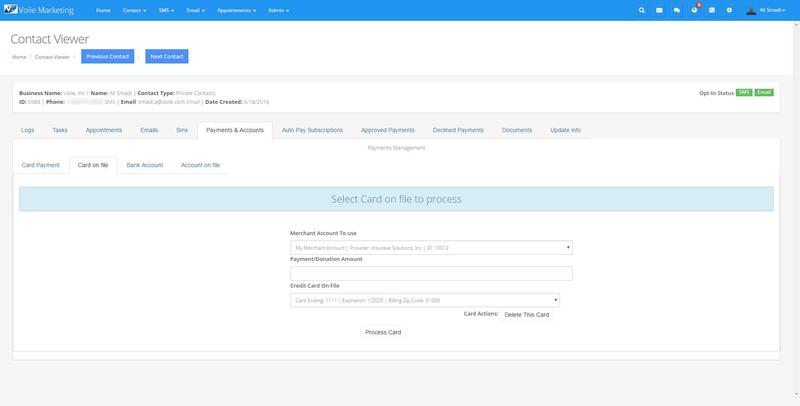 You can schedule payments or donations using ACH. 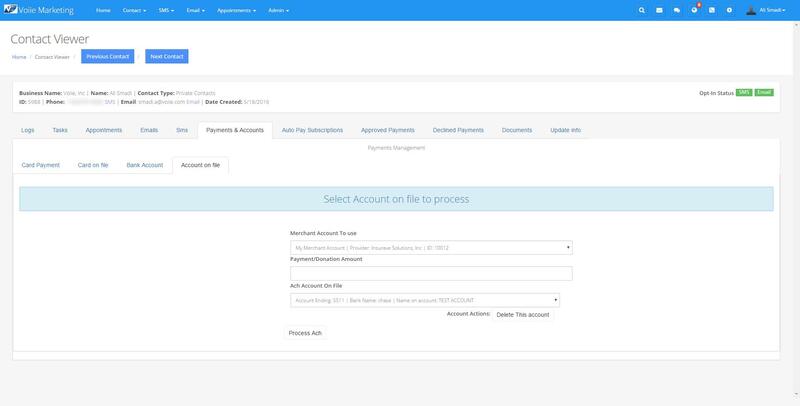 Securely store your contacts payment bank accounts for future use or payment scheduling. 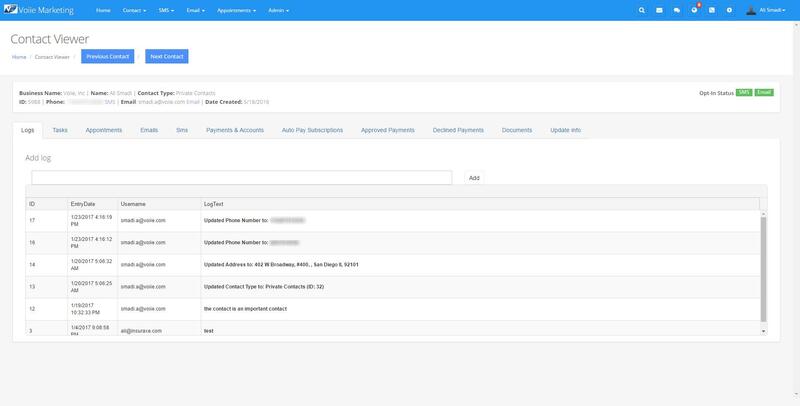 View your contact's declined payments details. Easily update any typos or information about your contacts. 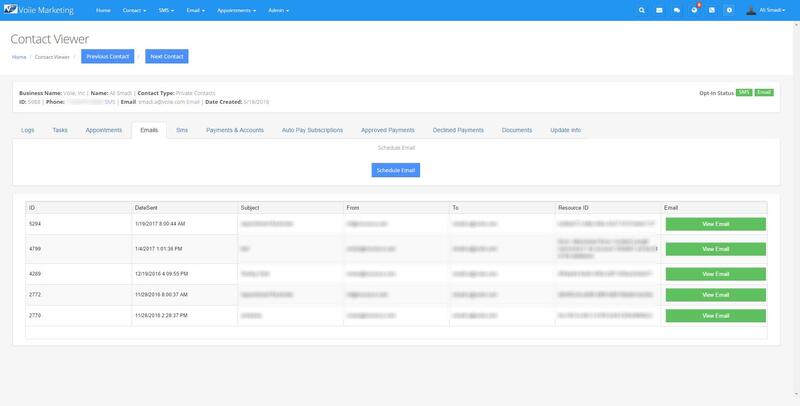 Easy Navigation to manage all aspects of your account at Voiie CMS. 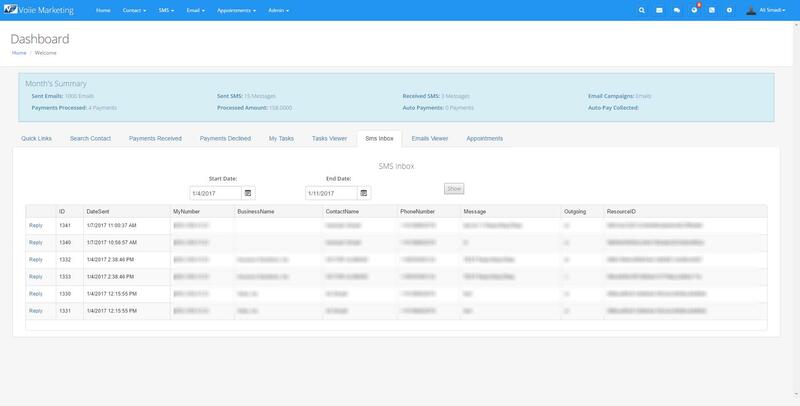 Manage your whole operation in single platform, contacts, sales, appointments, marketing and appointments. Insuraxe Solutions, Inc. All Rights Reserved.